BBC NEWS | Europe | Will Italian opposition's glee last? Will Italian opposition's glee last? 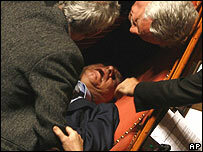 Even by the sometimes farcical nature of Italian politics the debate in the Senate on Thursday night was extraordinary. At times it descended into chaos as the deep divisions that split this house rose to the surface. Prime Minister Romano Prodi had called on the senators to give him more time. Italy, he said, could ill afford a political vacuum. But senators had already made up their minds - or rather all of them, with the exception of one! Nuccio Cusumano was one of three senators who had defected to the opposition earlier in the week. So convinced was he by Mr Prodi's last stand that he stood to announce he was breaking with his party and returning to the prime minister's side. His colleagues in the Udeur party set upon him with calls of "traitor" resounding around the chamber. He was even spat upon and, after collapsing in his seat with the tears welling in his eyes, he was carried out of the hall on a stretcher. And a similar fate was awaiting the government. While the votes were being counted it looked increasingly bad - in the end they were five short. The final result was 161 votes to the opposition's 156. Those who support opposition leader Silvio Berlusconi could hardly subdue their glee. 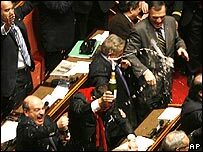 There were cheers around the Senate as some pulled out bottles of champagne, popping corks, much to the disgust of the Senate Speaker and no doubt a good part of the country. This may be a resounding victory for Mr Berlusconi, but for Italy there are many who consider it a disaster. This marks the end of two years of political stagnation. And in some ways it is difficult to blame Romano Prodi. It was legislation passed by Mr Berlusconi three months before he lost power - a system of proportional representation - that ensured greater power for the smaller parties on the left. It was a poisoned pill. The smaller parties were handed crucial seats in the upper chamber. Mr Prodi could only find a majority with the help of nine parties and throughout his time in office he was forced to compromise on reforms that were crucial to rebuilding the reeling economy. Mr Berlusconi had enjoyed five years in power thanks to the "old system". His new laws have taken Italy back in time to a period of revolving door politics. Italy has now had 61 governments since the World War II. On average that is almost a government a year and the opinion polls suggest the Italians are sick and tired of this political pantomime. It is President Giorgio Napolitano who must decide how to stop it. He has signalled he would like to see electoral reform to cure the chronic instability before the country next goes to elections. A caretaker government is a possibility. The president will speak to the leaders of both houses of parliament and party leaders over the next few days before deciding whether this caretaker government could win a majority. 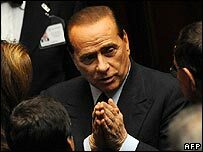 But Mr Berlusconi is unlikely to hand the momentum he has gained to a part-time government. He is a long way ahead in the polls and after 20 months of the centre-left, he can finally see a chink of light. His supporters were out on the streets on Thursday night, and the Forza Italia flag was flying again. The question is: Can he rally his coalition to win himself a majority, or might he fall foul of the same medicine he had served Mr Prodi? There are smaller parties in his coalition too. Certainly there is a period of political instability ahead which the business community is watching closely. "It isn't necessarily bad news. It all depends what comes after Prodi," said Unicredit MIB economist Marco Valli. "Markets don't like uncertainty, but if what follows Prodi is a stronger government, then that could be positive." But the European Union fears that Italy's finances may worsen in 2008 and that its budget will still not be balanced by 2011 as promised. Italian growth forecasts are being cut, industrial output is falling and consumer confidence is now at its lowest in two-and-a-half years. Analyst Tito Boeri, a professor of economics at Bocconi University, said that while Mr Berlusconi may be Italy's richest man, he is not the best option for the economy. Mr Prodi's record fighting tax evasion meant "his management of public finances was better than under Berlusconi", he said. 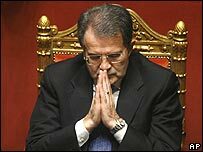 Mr Prodi will continue in the role of caretaker prime minister until a final decision is made. There will be sympathy for the prime minister. Many agree he had tried hard to put Italy on the right foot. Even one of Mr Prodi's most acerbic critics, Senator Roberto Calderoli of the far-right Northern League, said he admired his pluck: "He will fall with a soldier's honour for having fought to the end," he said.